LAST NIGHT we went to a dinner between 41st and 42nd Avenues, where a company of souls gathered to say goodbye to Sam Webster. Sam is going to Bristol University in October and temporarily leaving the Bay Area. The venue was pretty astonishing really – an Egyptian restaurant called Al-Masri, and decked out with Ancient Egyptian motifs. 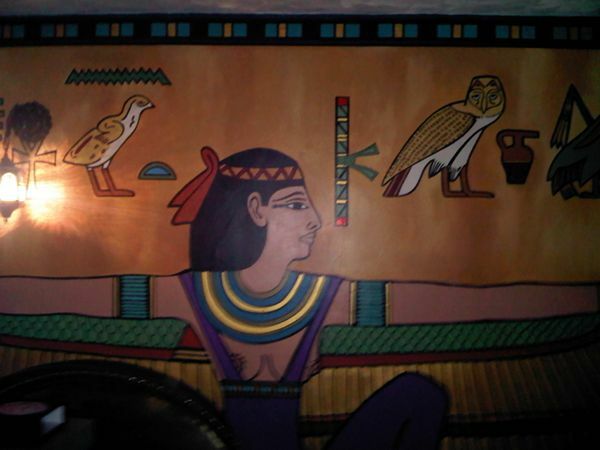 That included an Isis Room, with space for 12 to eat and gaze at pictures of Isis, like this one below.